Glenmere was built in 1911 as the country retreat of industrialist Robert Goelet. He commissioned the leading architects of the day, Carrère and Hastings, to create an Italianate mansion reminiscent of the villas of Tuscany that had enchanted him in his travels. Goelet perched the opulent mansion on a hilltop overlooking Glenmere Lake amid thousands of acres of land that he purchased at the turn of the century. Beatrix Jones Farrand, America’s first major female landscape architect, was called upon to create the incomparable Glenmere Gardens, much of which remains today. majestic interior details, including marble-columned porticoes and sweeping interior and exterior staircases. A painstaking restoration now returns Glenmere to its original magnificence, with flowing rooms and broad terraces all centered on the refurbished cortile. Original architectural details have been preserved throughout, and the landscape once more offers panoramic views of the surrounding hills and tranquil Glenmere Lake. The formal gardens are a particular delight. Today, Glenmere is a luxury escape, ready to host the contemporary guest in modern comfort while offering an irresistible opportunity to turn back the pages of time to a more graceful, gracious way of living. The Stagecoach Inn, formerly known as Anthony Dobbin’s Stagecoach Inn, was built in 1747 almost entirely from materials procured from the very land on which it now stands and is one of the oldest operating inns in the country. The Inn has been fully restored to its former glory by Faith Ferguson, with nearly every part of the building and its three plus acres of grounds being enhanced in a major revitalization project. Guests will enjoy the ambiance of its historic architecture combined with luxurious refined hospitality. With five well-appointed guest rooms that afford modern comforts, a library, solarium, café, parlor rooms and five working fireplaces, the Inn is a place of tranquility that harkens back to a bygone era where you may cast aside the stresses of everyday life. Grab a book and relax in a comfortable nook with a cup of tea. Stroll the property, which includes three beautiful acres that are a perfect backdrop for outdoor events. Venture into the town to peruse shops or the Harness Racing Museum. Or use us as a home base from which you may enjoy all that the Hudson Valley has to offer. 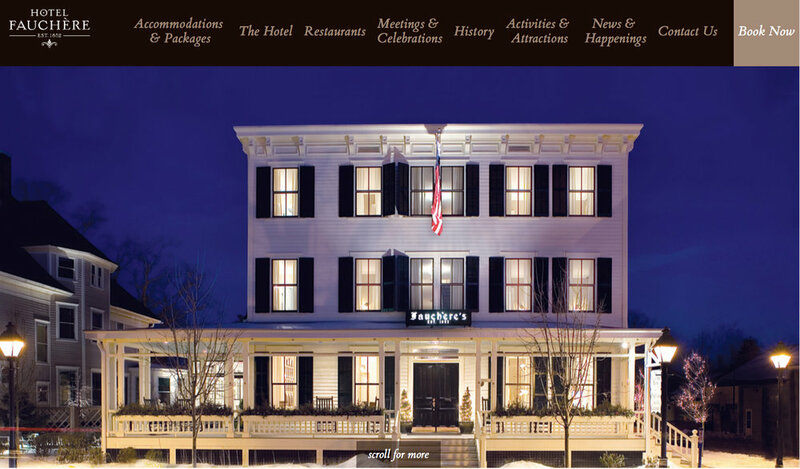 Whatever your pleasure or occasion, come and enjoy one of the Hudson Valley’s premier inns. Although Fauchère was a native of Switzerland, his mother tongue was French and he was thus known in Milford for years as “the crazy Frenchman”. It is unknown whether he earned his nickname for tempestuous behavior befitting a mercurial master chef, or because of the crazy dream he had for the Fauchère, or for some other reason. One thing that is known: Louis Fauchère’s innovative cuisine and stylish inn-keeping was a hit in Pike County. By the late 1870s, he had plans for a larger and grander building. The original building (since demolished) was moved to the rear of the property, and he set about constructing the elegant classic Italianate building that today remains the heart of the Hotel Fauchère. Fauchère maintained “personal charge” of the hotel until a year prior to his death, on September 11, 1893. His daughter, Marie Fauchère Tissot, took over and is remembered as, “a lady of marked executive ability and pleasing manners, under whose administration the house more than maintains its old popularity”, according to a biographical sketch of Louis Fauchère. The hotel was subsequently owned and managed by his descendants until closing in 1976, an impressive 124-year run under the same family’s ownership. 127 room hotel. Featuring complimentary hot “On the House” breakfast buffet, 24-hour coffee bar, business center, wireless Internet, and outdoor heated pool. Restaurants within walking distance. 117 rooms. Cable TV with free HBO. Conference/banquet facilities: 5–150 capacity. Special corporate and group rates. Pet friendly. Business center and meeting facilities. Adjacent restaurants. 82 rooms. 2 suites. Free coffee and morning toast bar. Guest laundry, vending room. 24 hour desk service. Rte 17, Exit 120. Pets accommodated.